Welcome to country: Bishop Tim Harris with Aunty Renata Prior, Birri-gubba nation of Townsville before his ordination. Photo: Emilie Ng. 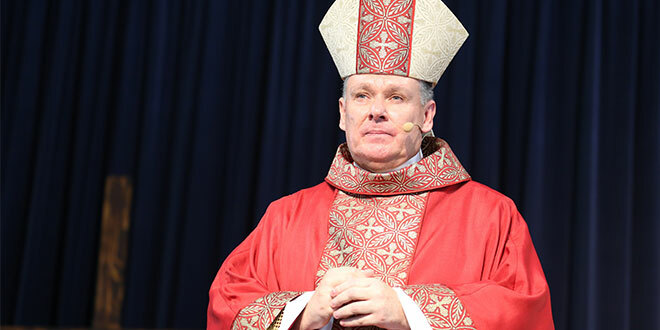 TOWNSVILLE’S prayers to see a bishop in their midst after a three-year wait were answered at an historic ordination last week. 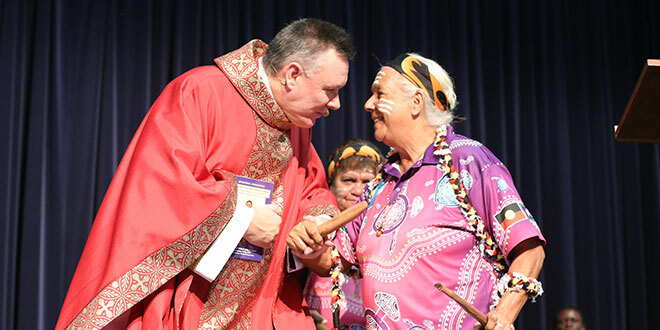 The ordination and installation of Bishop Tim Harris, a former priest of Brisbane, was also the first episcopal ordination in Townsville in nearly 50 years. More than 2000 people attended the Ordination Mass of nearly three hours at Ryan Catholic College on May 3. The Mass was live-streamed on the Townsvile diocese’s YouTube feed. Bishop Harris said he was unprepared for the huge welcome from his new flock. “They don’t even know me and yet they’re opening up their hearts, inviting me to come in,” he said. Bishop Leonard Faulkner, who was the third Bishop of Townsville between 1967 and 1983 and who has buried two of his successors, was among the concelebrating bishops at the Mass and handed the mitre to Bishop Harris. Australia’s apostolic nuncio Archbishop Adolfo Tito Yllana, Brisbane Archbishop Mark Coleridge and Cairns Bishop James Foley, a former teacher of Bishop Harris at the seminary, were co-consecrators at the ordination. Port Moresby archbishop Cardinal John Ribat was also invited to concelebrate. 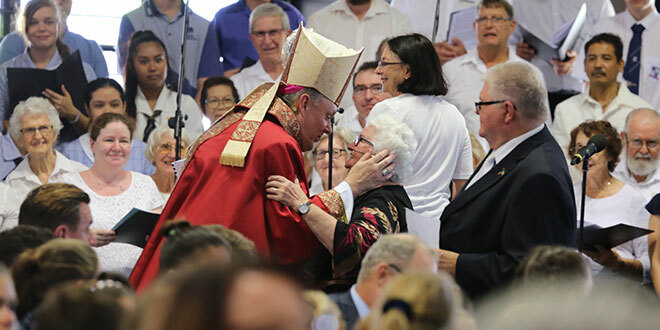 Townsville greeting: Bishop Tim Harris embraces Good Samartian Sister Ursula O’Rourke, who worked as the Director of Liturgy in Townsville for 10 years. Sr O’Rourke helped plan the Ordination and Installation liturgy. Photo: Emilie Ng. Among the special witnesses of the historic ordination were Shirley and Jim Harris, who watched from their nursing home room in Brisbane as their son took the mitre. In his first official address, an emotional Bishop Harris held back tears as he honoured his parents, who have early signs of dementia. “Mum and Dad, it was your lived faith that you passed on and modelled for me that has made all this possible,” he said. “Without you and your daily witness, I would be nothing. “You may not be with me in person but you are well represented by various family members. Townsville’s large Aboriginal, Torres Strait Islander and Pacific Island communities were also invited to take part in the Mass. Members of the Tokelauan community brought forth the Book of the Gospels singing a traditional Catholic chant in their native language sending goosebumps up the new bishop’s spine. Tasked at looking after a diocese larger than the size of Italy, Bishop Harris said his biggest challenge was estimating the cost of fuel he would need to keep his Subaru Liberty going to visit all his parishes, including Mount Isa, a mere 12 hours’ drive away. “I’m going to have to get in the car and just drive,” he said. But the bishop has promised he would not venture into the unknown alone. Instead, he is working on a proposal to gather representatives from every Catholic parish, school and agency to “map out a way forward”. “It’s a good opportunity, now that Townsville has a bishop, for us to look at what we’re doing well, what needs improvement and what we might do in the future,” Bishop Harris said. He will also call on the priest who was diocesan administrator while Townsville was without a bishop, Fr Mick Lowcock, for wisdom and advice. “He knows the history of the diocese, I’m the new kid on the block,” Bishop Harris said. Full coverage of Bishop Tim Harris’ ordination and installation as Bishop of Townsville will feature in the May 14 edition of The Catholic Leader.